Have you ever been reading through a long PDF file, wishing you could record your comments, reflections or ideas on the content? 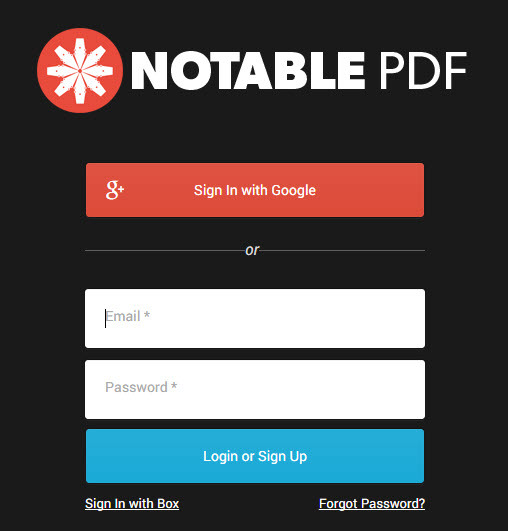 Notable PDF is a web application that allows you to do just this. It includes a range of annotation tools, including highlighters, comments, text, drawing (premium only) and formatting. Notable also integrates with Google Drive, allowing you to collaborate live on PDFs with others. 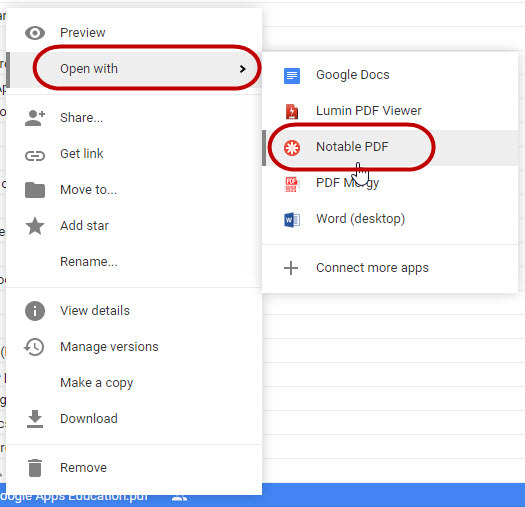 Similar to the Google Docs Editors, Notable shows you who currently has the PDF open. Comments and other annotations are also displayed in colours specific to the author. It’s a great tool for allowing multiple people to review and reflect on content together. In addition to the annotation and collaboration features, Notable can also just be used as a PDF viewer. The tool has both free and paid versions, however the free version is very feature-rich. Learn more about the pricing plans here. 2. Click the Add to Chrome button. 4. Once the extension has been added, you’ll see the Notable icon in the top right corner of Chrome. Click the icon to launch Notable. 5. Click the Sign in with Google button and enter your Google account details. Note: Although you can choose to create a stand-alone Notable account, signing in with your Google account provides the Google Drive integration outlined in the rest of this post. Once you have the Notable Chrome extension installed there are two ways to open your PDFs in Notable. 1. Right-click a PDF file. 2. Select Open with > Notable PDF. Note: If you do not see this option in the menu after installing the extension, reload Google Drive. The annotation tools are located to the right of the open PDF. To use them, select the desired tool and then select the text in the document you want to apply the tool too. The available tools (in order) are highlighting, strike-through, underline, comments, insert text, drawing (premium only) and select text. An example of a comment and highlight is shown below. The easiest way to collaborate on a PDF is to share it via Google Drive. Once shared, any person who opens the file in Notable PDF can collaborate on it simultaneously. Each collaborator will be shown as an icon in the bottom left corner. Those who currently have the document open have a green dot. Tip: Ask you fellow collaborators to install the Notable PDF Chrome extension prior to trying to collaborate on PDFs. Any annotations made to the PDF are automatically saved back to Notable. Therefore, next time you open the same PDF in Notable, you can see and add to the annotations. Likewise, any collaborators who open the PDF in Notable will also see all the annotations. If you want to view the annotations outside of Notable (ie. in a desktop PDF reader such as Adobe Reader), you can export the PDF with the annotations. (Tip: If you are just planning to keep opening the PDF in Notable, there is no real need to export it). 1. Click the Download button in the top right corner. 2. Select Your computer and the type of download you require. 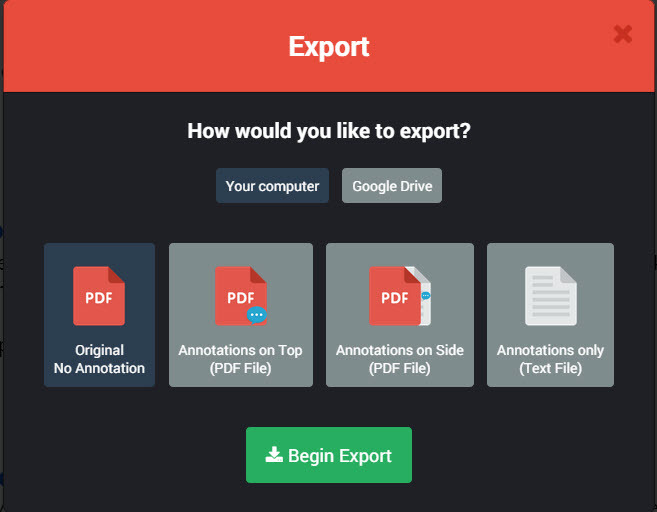 Note: Exporting direct to Google Drive is only available in the premium version of Notable. However, if you have Google Drive sync installed, you can download the PDF to the Drive folder on your computer and it will sync back up to Drive anyway. You can find more information on using Notable PDF features in their help centre.